Notre Dame-West Haven’s Connor Morgan, left, passes the puck down the ice as Greenwich’s Jack Hutchins pursues during the first period on Thursday. WEST HAVEN — Notre Dame-West Haven coach Larry Vieira feels his team is a resilient group. Playing in their share of close games, the Green Knights have found ways to win. Thursday evening was another example. Scoring twice in the final 2 minutes, 12 seconds of the second period, Notre Dame defeated Greenwich 4-1 in a Division I contest at the Edward L. Bennett Rink in West Haven. Notre Dame, ranked fifth in the GameTimeCT/Register Top 10 poll, did not need any comeback against the Cardinals. Instead, goals by Charles Andriole and Jack Luzzi propelled the team to its sixth victory of the season. After Notre Dame goaltender Connor Smith denied Matt Davey from the slot with a pad save less than a minute in and turned aside Andrew Frost from the left wing with seven minutes to go in the middle period, the Cardinals finally got the equalizer. Taking a perfect pass from Wesly Zolin, Davey snapped a shot past Smith to even the game at one with 6:47 remaining in the middle period. The Green Knights (6-5-1) made sure the tie did not last long as Notre Dame scored twice in the final 2:12 to take a 3-1 lead. 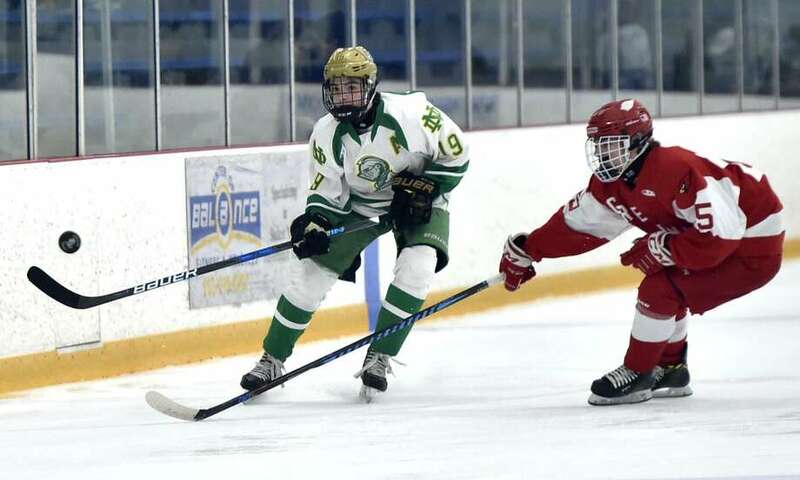 Andriole got things going for the Green Knights when he took a perfect pass from Ian Hayden and roofed a shot past Greenwich goalie Charles Zolin, with Thomas Hunt also picking up an assist. Notre Dame continued the pressure and that would pay off when John-Michael Childs fed Luzzi, who skated to the slot area and beat Zolin between the pads with 51.4 seconds left in the middle period. The Cardinals (5-7-2) had opportunities to get back in the game in the third period, but Smith was up to the challenge, making 12 saves in the final period. Smith denied Charlie Graves on a breakaway 4:56 in, made a stick save on a blast by Davey with 9:15 left, and made a pad save on a point shot by Andrew Frost with 5:10 to go. Smith capped the game by denying Thatcher Danielson in front with 4:34 left, and denied Ryan Columbo in front with two minutes to go. Notre Dame scored the lone goal of the opening period, capitalizing on its only power play opportunity of the stanza. Taking a pass from Zach Schroeder, Hayden deked in front and beat Zolin for a 1-0 lead 4:21 into the contest. Greenwich had six shots on goal in the opening period which were all turned aside by Smith. The best opportunity for the Cardinals came with 2:50 to go in the opening period as Jake Shredders went the length of the ice before being turned aside by Smith. Connor Smith — Notre Dame sophomore goalie made 28 saves, including 12 in the final period.